After a long winter, everyone is ready for warmer weather and being able to spend more time outdoors. Spring means the start of summertime activities and sports such as cycling, soccer, baseball, ultimate Frisbee, kayaking, canoeing, stand-up paddleboards, skateboarding, scooters and so much more. It would be ideal if the kids could grab their bikes and other sports equipment without dragging it through the house along with all the dirt, gravel or water that the sports equipment collects. 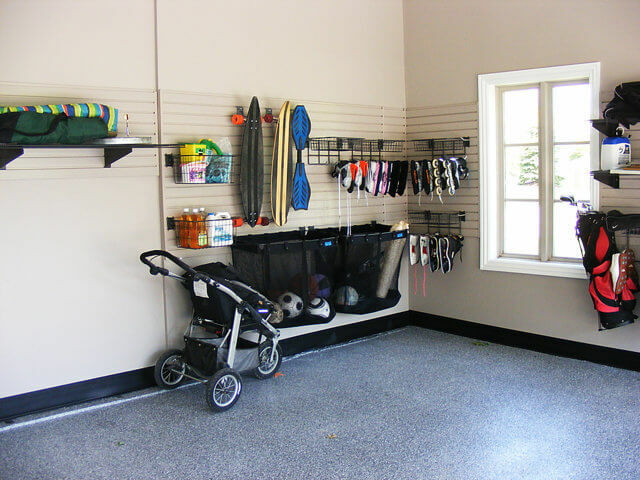 One of the best places to make it easy for children to use and replace their toys and sports gear is the garage. If you’re not currently storing the sports equipment in the garage, consider these garage storage solutions and how the garage can be remodelled and redesigned to accommodate all of these storage systems while having the vehicles parked inside. Storing sports gear in the garage is a good idea. Kids can run in and out of the garage during the summer days to find their toys without running through the house to return dusty or muddy or wet sports equipment to a location in the basement. Using an open style of storage makes it easy for children to figure out something they want to do. By placing sports gear and toys at the right height for your child’s age, each family member can fetch and replace things on their own. Learning good organizational habits early helps children maintain good habits later in life. Using closed storage solutions allows the family to keep expensive sports equipment such as golf clubs behind closed doors such as inside garage cabinets which lock up. This also helps keep a clean look to the design to the interior of the garage when cabinets are added to the storage system of the garage. Of course, there is also sports gear which you might want to put away when spring arrives. These might include skates, snowboards, skiis, hockey equipment, toboggans and more. You may not have enough garage wall space to hang out the winter equipment as well as the spring / summer ones along with other tools which you may want to have handy during the summer. In this case, overhead storage would be a good way to store items which you are unlikely to use for the season. When you’re using overhead storage, you likely have your spring / summer equipment located in this area in the winter. If you haven’t already, you’ll want to pull out spring and summer toys or sports equipment from overhead storage so you can lay it out for easy access. At the same time, snowboards and toboggans can be returned to overhead spaces until next winter. Depending on the height of the garage, seasonal storage spaces may include made-to-measure platforms as well as mezzanines where they can be designed to fit the overhead space from one corner of the garage to the other corner of the garage. Mezzanines are typically built with glass railings to easily view what’s stored above and still prevent larger items from rolling off the edge. To get up to the mezzanine, a pull down attic ladder or stairs can be part of the installation although we’ve also used lifts and electric stairs. Other off the shelf overhead storage solutions include platforms and shelves which come in standard sizes. Shelves which are less than 2 feet in depth can be mounted to the wall. Other platforms with a 4 foot depth would need to be mounted in the centre of the ceiling so someone can climb up from any one of the four sides to be able to reach items closer to the centre. Certain sports equipment may be stored in the overhead space during all seasons even if we use them mainly through the spring and summer. For instance, kayaks and canoes are bulky and won’t easily store on shelves or walls. If you garage has enough space, floor standing racks may be an option but most people don’t have enough space available in the garage to do this. 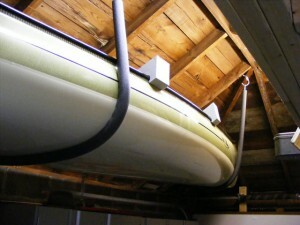 Instead, kayaks, canoes and even Thule cargo carriers can be stored away safely overhead with a sling. They can stay there whether it is spring, summer, fall or winter. Add a hydraulic lift system and it makes it even easier to mount or remove from the roof of your vehicle. With the touch of a button, the hydraulic system will do the heavy lifting. Hydraulic racks for bicycle storage and golf club storage are also available. Even young children who wouldn’t be able to lift a bicycle onto certain wall rack systems would be able to use the hydraulic rack system. With the press of a button, they could have the hydraulic rack lower so they could position their bike into place and then push a button to raise the bicycle rack back into place in the overhead space. A variety of wall racks for bicycles exist including fold away racks that tuck bikes flush with the wall like pages in a book. Other racks allow bikes to mount flush with the wall to maximize space for parking vehicles. Some racks are installed into the ceiling and some are mounted into the wall. For young kids who ride in and out all day, using a floor standing rack for kids to wheel their bikes into the gride and walk in for lunch without minimal fuss. This may not be an all season solution but in the summer when the kids are constantly on the go, this may be an effective way to keep their bikes from being left just anywhere inside the garage or on the driveway. Finally, for most sports gear, a slatwall organization system would accommodate most equipment. They offer a variety of camlock hooks, baskets and bags to store a wide variety of balls as well as gloves, shoes and other types of sporting equipment. 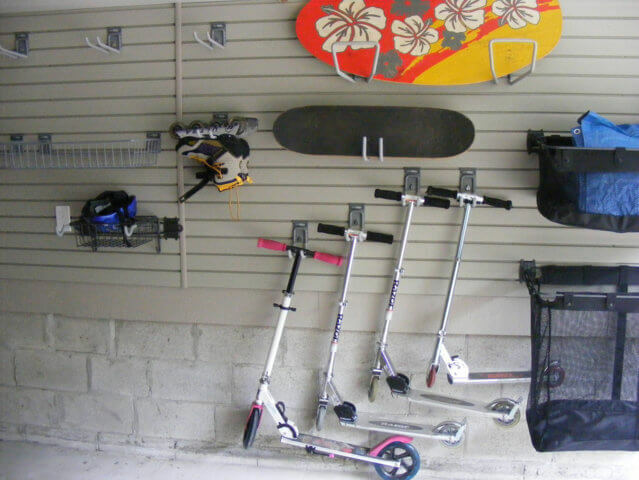 Scooters, skateboards, bats and other equipment can be hung from hooks. Balls can be stored in the storage bags which hang from the wall. And, baskets for baseball gloves, shin pads, helmets as well as other protective equipment can be mounted in a wide variety of configurations to suit the outdoor lifestyles of everyone in the family. If you’re looking for a better way to keep the kids playing without dragging in the dirt, mud and wet equipment of their favourite sports, consider contacting our garage renovation specialists for a complimentary in-home consultation today. Storing sports equipment in the garage makes a lot of sense. There never seems to be enough storage space in our homes. When we exhaust storage space inside, the garage is the most likely space to fill the void. However, with a limited amount of space, the garage can quickly become a cluttered dumping ground for the entire family. Our garages house important items like tools, lawn and garden supplies and sporting equipment. However, mounting garage clutter often includes items that are broken, outdated or no longer needed. If your garage is overflowing; you’re forced to park your vehicles in the driveway; or you haven’t seen your garage floor in years, you’re probably frustrated with your storage situation. Before you consider renting additional storage space, look for ways to maximize your available space. The first step to reclaiming precious square footage in your garage is to annually purge unneeded items. Give new life to an old table or dresser by repurposing or donating it. Give away unnecessary duplicate items. Toss broken toys and furniture. Safely dispose of expired household cleaners. Once you’ve pared down to the necessities, you may discover that you still have more than you can fit comfortably in your garage. To find additional space, look overhead. Overhead space offers an ideal way to store items while reserving premium floor space, maximizing unused space, keeping items stored out of sight and out of the reach of small children and pets. With a variety of overhead storage options available, let’s explore five ways you can use overhead storage to save space in your garage. Overhead shelves come in a variety of options. Sturdy steel overhead garage shelves—secured to ceiling joists or to the ceiling and a wall—are designed to support several hundred pounds. For safety, overhead shelving should be installed by a garage renovation specialist or an experienced professional knowledgeable about how to properly install weight-bearing shelves. Holiday decorations, camping gear and other seasonal, or seldom-used items can take up considerable space in your garage. Such items are ideal for overhead storage because they don’t need to be accessed frequently. A small step ladder provides access to overhead shelves. If climbing up and down a step ladder isn’t appealing, try hydraulic shelves. With the touch of a button the shelf lowers for loading. Another push of the button raises it overhead again. Large ladders come in handy if you own a multilevel home. Yet, they can be difficult to store. Even when stored along a wall, a large ladder consumes a lot of valuable real estate. Store bulky household items overhead using overhead shelving or an overhead rack made especially for storing such items. Ladders aren’t the only bulky items that might be stealing space in your garage. Kayaks, skis, surf boards, snow boards, fishing poles, roof racks and other unwieldy recreational items can either be stored on overhead shelving, specialty hooks or a customized overhead sling. A made-to-measure overhead garage sling has the added benefit of making it easier to load kayaks and roof racks onto your vehicle. It can be difficult to find just the right place to store your bicycle. A variety of vertical and horizontal wall racks are available. However, if there is limited wall space left or you already have a tight fit in your garage, overhead bicycle storage provides another good option. 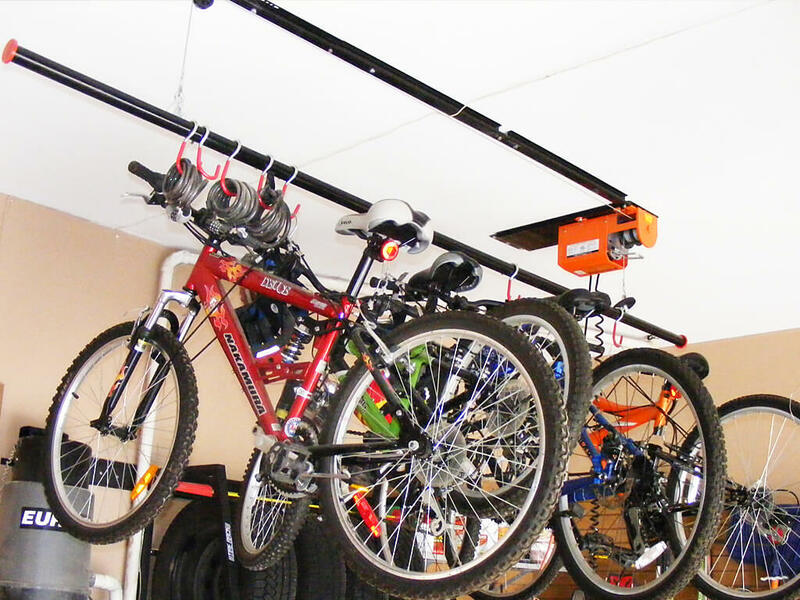 Overhead bicycle storage racks operate on a pulley system that is either manual or motorized. 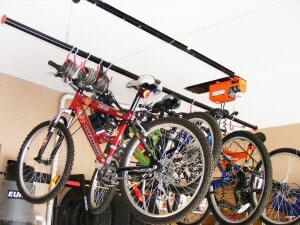 A two-bike pulley system stores bikes flat against the ceiling and requires minimal clearance space. The five-bike pulley system, which requires 60-inches of clearance, is designed to take advantage of the generous height of tall ceilings. 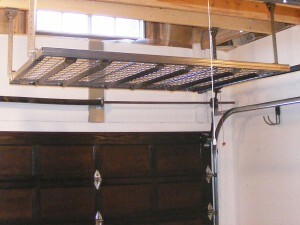 Towering garage ceilings offer another exciting option for maximizing storage space. A custom-built mezzanine provides additional space ideal for storing seldom-accessed items. To accommodate a garage mezzanine, the ceiling must be at least 14-feet high and deep enough to accommodate the 8-foot depth of the platform, without obstructing garage door rails. Mezzanines run the full width of the garage and can either be installed at the rear of the garage or over the garage door. 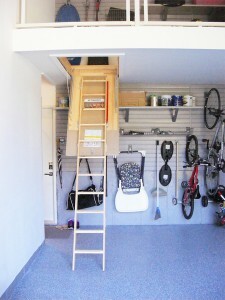 The overhead garage balcony is accessible via step ladder, stairs or even a car lift. Light, bulky items—like seasonal decorations and off-season sports equipment—are ideal for storage in a mezzanine. Overhead space is an untapped storage jackpot in most garages. Sturdy steel overhead shelving is the perfect place to store seasonal and seldom-used items. Specialty racks make light work of storing ladders and other bulky items overhead. 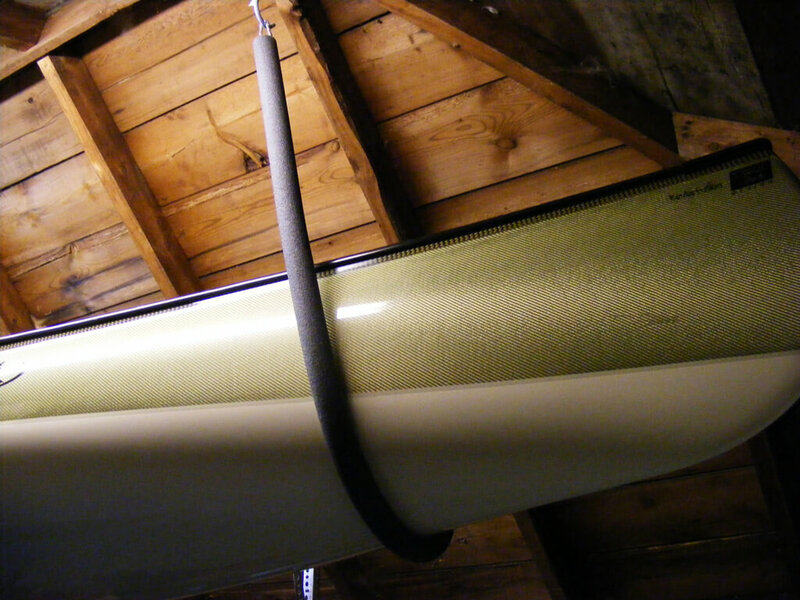 Customized overhead slings make lifting and lowering kayaks, roof racks and other sporting goods a breeze. Overhead bicycle racks safely store multiple bikes while reserving floor and wall space. A made-to-measure mezzanine provides loads of overhead storage space for bulky items. Need more storage in your garage? Contact a garage renovation specialist to discover how overhead storage options can maximize your storage space.